I think the best place to begin this series on Brain Food is the beginning – a look at the backdrop of the human brain. So let’s rewind the clock and see how the brain changed from that of our early ancestors to the modern Homo Sapien brain. This is the journey of your brain on meat. If we could turn back the clock about 3 million years, we’d find ourselves in an African forest. The weather would be warm. And we’d share the woodlands, riverines, and trees with other hominids – the great apes including orangutans, gorillas, and chimpanzees. We might even see Lucy. Our early ancestors like Lucy ate a plant-based diet. And they spent most of the day doing just that – chewing through leaves and plants. They had very large guts (cecums) which housed a massive amount of bacteria that could converted this fiber to fat. So although they ate a plant-based diet, they were fueled by fat. Gorillas are similar to Lucy. A gorilla eats leaves and this activity take up most of their day. Leaves are about 60% protein and 40% carbohydrate (with just a miniscule amount of fat < 5%). But thanks to their large guts they can take all that fiber, which makes up about 75% of the leaves’ dry weight, and they can ferment it into short-chain fatty acids (SCFAs). 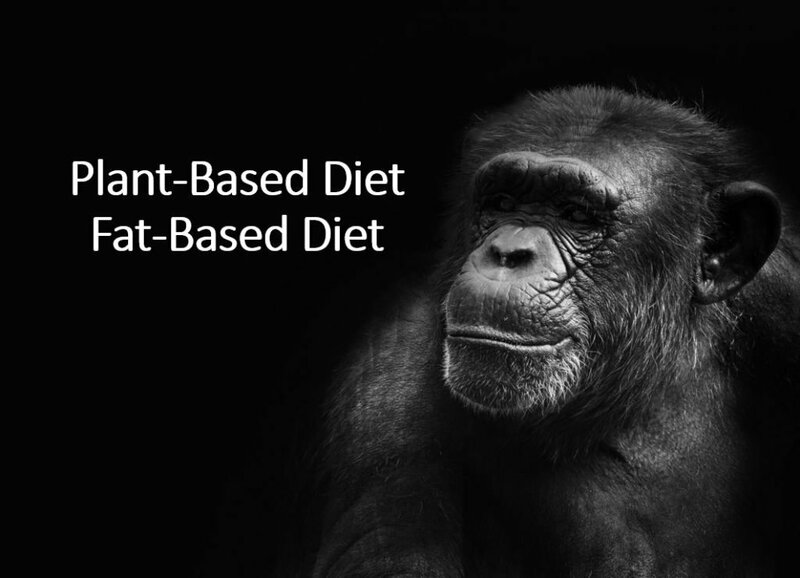 So, in reality, the gorilla eats a diet that is about 20% protein, 10% carbohydrate, and 70% fat – nearly all of which is saturated fat. Our ancestors’ specialized guts wouldn’t have allowed them to eat much meat. If they did their large colons would be at risk of twisting causing immense pain and could even be fatal. The fossil record shows an astonishing change about 2.5 million years ago. Humans diverged from their hominid ancestors. The distinguishing feature – the brain – began to explode in size. This divergence coincided with another change. The earth began to cool. Forest and waterways turned into arid savannah. Rains became more scarce. Luxuriant plant growth and rainforests turned into grasslands and tundra. Even places close to the equator had climate similar to that of Northern Canada today. The backdrop of human evolution is one of long cold winters and short cool summers on African savannas populated with grazing animals. This climate change put our hominid ancestors at a crossroad. As leaves, fruits, and flowers became increasingly scarce, it took more time and energy to venture across ever-spreading grasslands to find food. The crossroad our early ancestors faced was to either continuing trying to subsist and compete for plant-based food that was disappearing or venture out and incorporate new sources of food. What the barren grasslands lost in vegetable life it gained in animal life. Meat was abundant. We stood at a crossroad: adapt or die. With this divergence in diet came different nutrients. Animal fat is different than the fats derived from plants. Animal fat provides a ready-made source of long-chain fatty acids, including pre-made 20 and 22 carbon chain fatty acids (AA, DTA, EPA, DHA) all of which are essential for brain development. All of which are found only in animal foods. The longest chain in vegetable oils – linoleic acid which is an omega-6 and alpha-linolenic acid which is an omega-3 are 18 carbon fatty acids. Humans, like all mammals, can chain elongate by desaturating these 18 carbon fatty acids to produce the longer 20 and 22 chain fatty acids – but we are extremely inefficient at doing this. The conversion of 18 carbon fatty acids into the 20 and 22 carbon fatty acids would have been impossible to fuel the brains exponential growth. It’s far too inefficient. The importance of these animal-based fats on brain growth are highlighted in a recent randomized controlled trial. When we look back at the building of the human brain, we see a feedback loop that shaped our future. Colder climate led to more meat consumption which led to bigger brains as natural selection favored the advantages associated with coordination and communication that facilitated successful scavenging. This was a cycle that reinforced itself. A cycle that forced ever-increasing meat consumption to build an ever-growing brain, which required ever-more energy. He was known as “handyman” because he butchered and skinned animals with stone tools. Handyman survived for hundreds of thousands of years. By this time animals like reindeer, bears, rhinos, and mammoths had become the prominent food sources. And as the feedback loop continued, the brain continued to grow, to about twice the size of Handyman’s. Communication and cooperation, ingenuity and invention, are hallmarks of the human brain, features that catapulted humans to the top of the food chain. Meat was the fork that diverged humans from our hominid ancestors. As we’ll see in the coming sections, this meat not only built our brains, but it changed our bodies. (r) Our huge brains became our biggest weapon and biggest liability. It’s the distinguishing feature that makes humans human. We built these magnificent brains over millions of years. Recently we’ve started tearing them back down at an alarming rate. We’ll be diving into this in Part II – Your Brain on Plants. 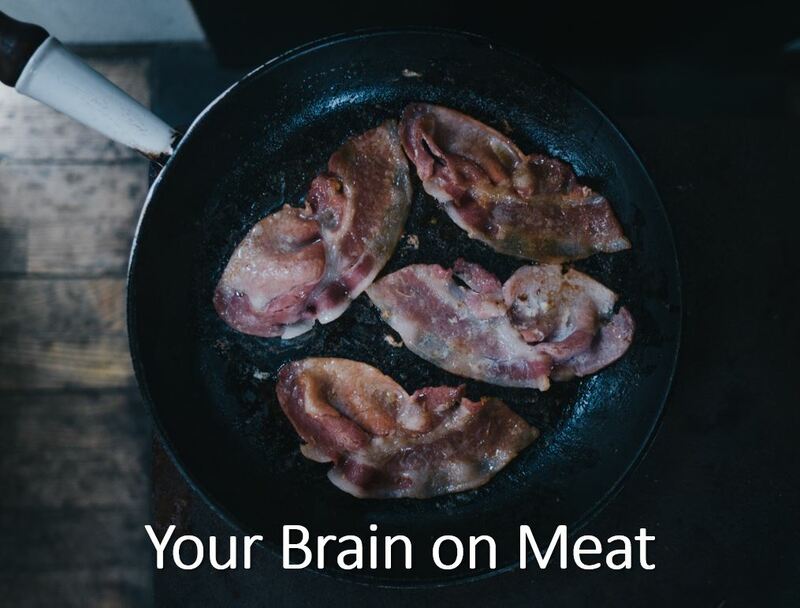 In the next section of Your Brain on Meat – “The Brain-Body Paradox” we’ll see how the brain changed the body, and the great sacrifices made to support the brain. In the meantime, The Health Dangers of a Plant-Based Diet, is a great precursor to Part II in the Brain Food Series: “Your Brain on Plants” (coming soon). Well written Kevin. I’m currently reading Daniel Lieberman’s The Story of the Human Body. Your post was a great supplement to his book. Enjoying your writing. Thank you! Great story and eye-opening. Eager to read the rest. Hi Dr. Stock, thanks for the great information. My DNA indicates APOE 4,4 and every bad FTO marker combination in the book. Standard advice for all those markers is to greatly limit saturated fat (and carbs too btw). Can you comment on that aspect relative to your research and expertise? Hi Brian that is a very good, but loaded question. For example, I know when some people eat dairy their cholesterol rises dramatically, but falls when dairy is removed. This is not to say that high cholesterol is bad, there’s a lot more to it then that, but certain foods can trigger certain responses, and like you mention, genetics can absolutely play a role. I’m a long time carnivore-diet believer, supporter and eater. However, I deal with severe anxiety and, while many others seem to be getting anxiety relief from eating this way, I am not (at least not yet). And I have gone as long as 7 or 8 months at a time eating nothing but beef, salt and water. I am positive this is what my brain wants me to eat because our evolution proves it and I’m assuming that eventually I will adapt, as many others have, but my brain seems to fight me very hard on it. I have a few questions for you that I will first explain. I’m hoping to understand how much fat I should be eating based on what makes sense from an evolutionary standpoint, because I’m assuming that eating the right amount of fat and protein by selecting the right meat is what will help me the most in the end, as far as adaptation to the diet goes. Considering that the reason this diet must be working for people is that it mimics what we used to eat. As early primates eating a plant based diet, we were essentially running on fat for energy from the bacteria. So this makes me assume that our body currently wants to run on fat. I have also read a lot about how making the body use protein as a fuel source i.e. 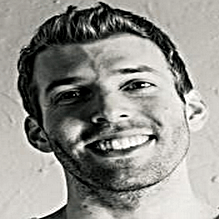 eating lots of protein without lots of fat is inefficient and unhealthy. However, even today’s wild game, which is what all of our meat would have been during the years of our evolution, is quite lean. From what I understand anyway. To make it even more confusing, considering that we started to eat meat because of colder climates, this would assume that animals had less plant foods to eat and, therefore, would be even leaner than today’s wild game. So, would humans have evolved eating lots of lean (or at least much leaner than today’s meat) protein and very little fat? Or is there something I’m missing? All of the current advice says that we should be eating fatty meat to use the fat as our fuel source, but where would our ancestors have procured this fat? And even if they did cherish and seek out fat (which I’m not saying is true, I want your opinion), surely the animals of this time wouldn’t have much fat to be found. So are we supposed to be eating fatty meat if we want to mimic what our ancestors would have been eating throughout the millions of years while our brains were growing? Current advice of zero carb/carnivore practitioners is to eat fatty meat, which is what I have been trying to do, but the points I’ve brought up here have always made me doubt that our ancestors evolved on eating anything but lean meat. First, mental health is a complex, multi-faceted problem. While I think diet has a profound impact, it’s not the only thing. Second, evidence is quite strong we ate fatty animals throughout much of our evolutionary history. Megafauna were very fat animals. That said, I don’t think obsessing over protein:fat ratio is necessary. If you feel better with fattier cuts (many people do) then steer towards fattier cuts, perhaps in the ballpark of a 1:1 ratio of fat:protein grams. I eat a bit leaner than this typically.